Through all the noise and controversy surrounding the return of Army Sgt. Bowe Bergdahl, one thing has remained clear – President Obama is not apologizing for his decision to bring Bergdahl home. “We do not leave anybody wearing the American uniform behind,” he repeated, citing this as a basic American principle. What about another American principle – refusing to negotiate with terrorists? First explicitly brought up during the Reagan presidency, and again played a leading role in the Bush administration, this principle has been embraced by numerous American politicians as a central tenet of American foreign policy. But is it true? Take a look at some of the most glaring – as well as some of the least well known – examples of U.S. negotiations with terrorists throughout history. 1979: Iran Hostage Crisis – Iranian revolutionaries take more than 60 Americans hostage from the U.S. Embassy in Tehran, prompting a substantial response from President Jimmy Carter. After several strategies including embargoes and economic sanctions fail, Carter’s negotiations with the revolutionaries lead to the unfreezing of over $8 billion in Iranian assets. The hostages were freed after 444 days of imprisonment, just after Carter left office and Ronald Reagan was sworn in. 1985: The Iran-Contra Affair – In direct opposition to an arms embargo, President Reagan authorizes the selling of arms to Iran, in exchange for seven American hostages held by Iranian terrorists in Lebanon. Amid heated backlash, Reagan denies any wrongdoing, only to later admit his knowledge of the affair. 1995: Bill Clinton meets with Gerry Adams, political leader of the Irish Republican Army, ignoring not only requests from Britain not to meet with Adams, but also the IRAs position on the State Department terror list. The IRA remained on the list until 1998. 2002: The George W. Bush administration pays a $300,000 ransom to Abu Sayyaf, an Islamist extremist group in the southern Philippines, to secure the return of two American missionaries, Martin and Gracia Burnham. Efforts by the Philippine military to rescue the missionaries results in Martin’s death, and Gracia’s return to the United States. Whether Abu Sayyaf had even received the ransom money, was never confirmed. 2009: Tom Pickering and Robert Malley, former U.S. government officials, meet with leaders of the Palestinian terrorist group Hamas. The meeting, held in Zurich, is just one of a long string of meetings between Hamas and U.S. officials with ties to both the Clinton and Obama administrations. 2010: British hostage Peter Moore is released in Iraq, in exchange for the release of Qais al-Khazali, a prisoner being held by the U.S. military. 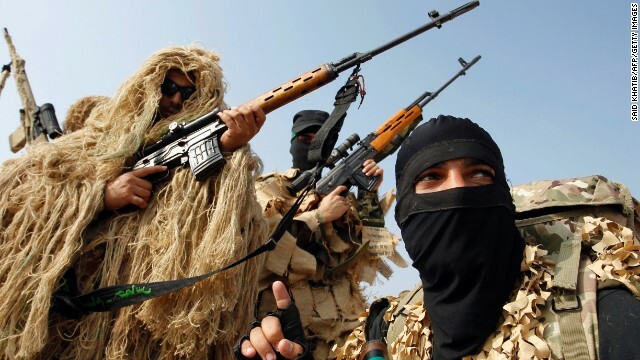 Khazali, the leader of the Shia military group League of the Righteous, was suspected to be involved not only in Moore’s kidnapping, but also in the killings of five American soldiers.